Your kitchen table is one of the most important furnishings in your home. Your kitchen table is one of the most important furnishings in your home. Not only do you gather around it to have a casual meal and catch up with your family, but it’s also a great place for your kids to sit and do homework or for you to get a head start on food prep for tomorrow’s lunch or dinner. How can you make the most of your kitchen table? That’s a good question. Matching your kitchen table with the other furnishings in your kitchen will add another layer of appeal to the entire room. If your table is made of wood, don’t hesitate to paint it in the same color that your wooden kitchen cabinets are. Make your modern kitchen as breathtaking as it is functional. Kitchen tables can make your countertops more accessible as well. Worried that you don’t have enough counter space due to excessive clutter? You don’t have to be anxious about that anymore. Use your kitchen table to extend your counter. That way you might be able to make use of a kitchen island without having to disrupt your daily routine. Even so, you can always expand your existing kitchen island so that you can connect your island with the counter. Whether you would like a country-style kitchen or one with a more rustic aesthetic, consider going back in time with your kitchen table. The legs and chairs that go with this table are far more decorative than you might think. When you’re in the mood for a light lunch or breakfast on the go, this table style could be the one that you want. One last option is to make your kitchen as elegant as possible. Even the humble kitchen can be made to look more elaborate. After all, if your home is your castle, go ahead and push the limits of that notion. That said, you’ll want to make sure you have the right kitchen aesthetic for it. A modern kitchen would suit this table much better than an older-style one. 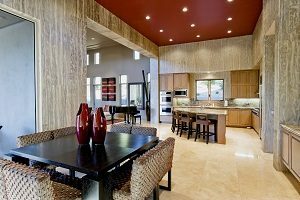 You should investigate how to get a chandelier installed in your kitchen if you don’t already have one, and break out the tablecloths for your next candlelit dinner with wine and music for an unforgettable night. This entry was posted on Wednesday, May 16th, 2018 at 9:09 am. Both comments and pings are currently closed.